The power of Whisky can turn you around. The Isawa (ç³å) 10YO Whisky is a single malt produced by Monde Shuzou. Established in 1952 in one of the main Japanese wine making areas, Yamanashi Monde Shuzou is mainly a wine production company. For a few years they tinkered with the so called Ji-Whisky (a concept similar to micro-brewing) and sold small amounts of their two blended Whiskies Royal Crystal and Fuji no Sei locally. However then they became serious with their Whisky efforts and produced the Isawa range, proving once more that Whisky does have the power to turn you around. 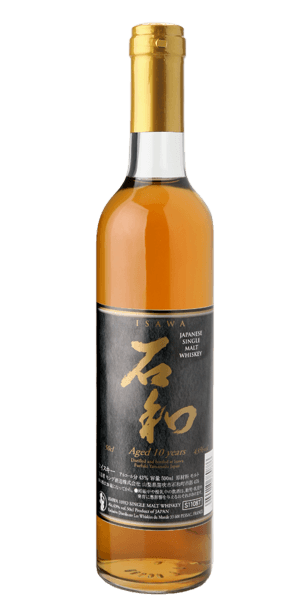 What does Isawa 10YO Whisky taste like? The Flavor Spiral™ shows the most common flavors that you'll taste in Isawa 10YO Whisky and gives you a chance to have a taste of it before actually tasting it. Somewhere in the middle - neither Scottish/Irish/Japanese, nor bourbon profile. Honey with ripe fruits. Sweet and yeasty. More specifically notes of nuts, chocolate, ginger ale and grape jam. Quite mild, creamy and sweet. Hints of cedar wood, cardboard? !, ginger, cardamom, cinnamon. Slight chilli sensations, dry spices, medium long with an alcoholic taste that lingers for some time. Wood influence is present, but not dominant. Unusual style and difficult to compare to other whiskies.